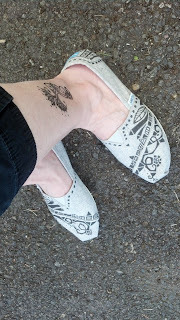 I showed you my doodled shoes a few weeks ago, I finally got brave and wore them this weekend. But not until after I sprayed them with a water resistant finish. I was so afraid of getting them wet or soiled I hadn't wanted to wear them. But they aren't a piece of art to hang on the wall. They made it safely through two art sales this weekend, without dripping my lunch on them or tripping in the grass. Now I think I am ready to take some custom orders. They are hand drawn, so no two will ever be alike, maybe similar. Tom's were pretty easy to work on. I was thinking a pair of mens Vans might be fun to try. I finally got my new temporary tattoos bagged and ready to sell. 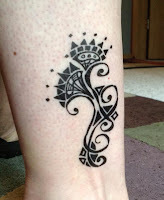 This is on my ankle. I've had it on for a week now and it still looks good. I've been amazed at how well they stay. Although the smaller one I put on my wrist didn't last as long, it was getting washed and rub to often. She Who Doodles is be-doodled. I'm joining in over at Becolorful for Motivated Monday, hosted by Pam. Check out all the projects posted today. 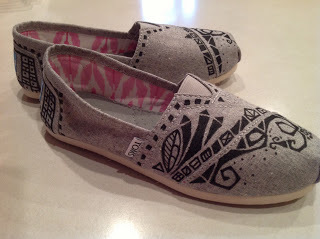 I love your doodled shoes! So creative! Hi, I love your doodles. You are an inspiration. Your shoes are great!! I doodled on a pair of leather shoes several years ago and they're still holding up. I like the idea of temporary tattoos. I've never wanted anything permanently inked on my body...too much of a commitment! I think a temporary one would be fun though. Oooh Cyndee, these are totally, totally GORGEOUS!!! I love them! How unique and stylish is this? I should definitely keep them and be a walking doodle advert! Lovely idea. I've got mixed media art on my wheelchair spoke guards so carry my art with me, and it generates so many fabulous comments from people - you get into amazing conversations with total strangers and they always go away smiling - a way to make someone's day, as well as your own!! Thanks for your lovely comment - I have definitely been overdoing it, but my legs are a lot better now, although still a bit swollen. The main stressor is Mum at the moment - we've having a lot of trouble with her settling in and the constant stress is taking its toll.